That approach, though, has run into some major obstacles when researchers move from the blood cancer to solid tumors. But now a group of scientists working with UC San Francisco’s Wendell Lim say they’ve come up with a new therapeutic model for T-cell engineering that promises to overcome that hurdle and make it a more precise weapon that can tackle solid tumors while avoiding off-target reactions that threaten patients. The key to this new approach is a new receptor: synNotch. Taking a cue from nature, which relies on a sensor called Notch to perform key functions, the synthetic biology engineers say they can add a receptor that includes one section that sticks out from the cell with one that lies inside. By tinkering with synNotch they can reengineer the immune cell to run down a particular cancer cell target and then issue instructions to turn genes on or off to set up the other half of the therapeutic equation. In a project described in Cell, the team says they created a synNotch that recognized an antigen on the surface of the cancer cell while the internal mechanism contributed a chimeric antigen receptor that recognized a different antigen. They then tested it on a mouse model that included two different tumor cells: one with both targets recognized by the external synNotch sensor and the CAR and one with just the CAR target. The newly programmed attack weapon zeroed in on the two targets (which required synNotch activation for it to work) while leaving the other alone, providing preclinical proof-of-concept evidence that they could create a much more efficient tumor cell killing vehicle. The team was led by Leonardo Morsut and Kole Roybal. Lim added that it is possible to reengineer a T cell with multiple synNotches to make it even more precise. And there are added applications for autoimmune disease, regenerative medicine, and more. The Notch protein is one of the most mechanistically direct transmembrane receptors—the intracellular domain contains a transcriptional regulator that is released from the membrane when engagement of the cognate extracellular ligand induces intramembrane proteolysis. We find that chimeric forms of Notch, in which both the extracellular sensor module and the intracellular transcriptional module are replaced with heterologous protein domains, can serve as a general platform for generating novel cell-cell contact signaling pathways. Synthetic Notch (synNotch) pathways can drive user-defined functional responses in diverse mammalian cell types. Because individual synNotch pathways do not share common signaling intermediates, the pathways are functionally orthogonal. Thus, multiple synNotch receptors can be used in the same cell to achieve combinatorial integration of environmental cues, including Boolean response programs, multi-cellular signaling cascades, and self-organized cellular patterns. 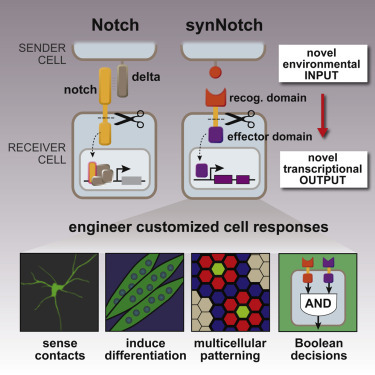 SynNotch receptors provide extraordinary flexibility in engineering cells with customized sensing/response behaviors to user-specified extracellular cues. UC San Francisco scientists have created a new class of highly customizable biological sensors that can be used to form “logic gates” inside cells of the immune system, giving these cells the capability to home in on and kill a wide range of cancer cells while preventing them from attacking normal tissue. As reported in two companion papers published Jan. 28 in the online edition of Cell, in addition to their potential to bring much-needed precision and safety to the form of cancer immunotherapy known as CAR T cell therapy, these versatile new sensors, known as synNotch receptors, can also be inserted into cells such as nerve and muscle cells. The receptors may have uses in regenerative medicine, in the treatment of autoimmune diseases, and in basic biological research. One of the pioneers in the whole gene therapy movement of the past 35 years has combined his knowledge of viral vectors with the hot new CRISPR/Cas9 tech to tackle a rare genetic liver disease. And his work with rodents highlighted both the promise of this new technology as well as an unexpected hurdle. 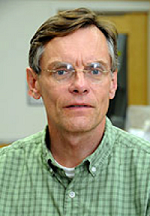 James Wilson at the University of Pennsylvania is virtually the father of adeno-associated virus–or AAV–vectors used to deliver gene therapies. After years of up and down progress, including an early patient death that slowed research in gene therapies for decades, his technology was in-licensed by ReGenX, which has since outlicensed it to a group of biotechs pursuing new gene therapy programs. In what is described as a first in research circles, he used an AAV vector to deliver the components of CRISPR/Cas9 gene editing tools into a mouse model of a rare metabolic urea-cycle disorder, triggered by a deficiency in the ornithine transcarbamylase (OTC) enzyme. When one of a series of enzymes is missing or “deficient,” ammonia can accumulate in the blood and circulate into the brain, where it can badly damage brains. OTC deficiency occurs in one in every 40,000 births. Wilson’s group used one AAV to deliver a Cas9 enzyme–the cutting tool–specifically into liver cells. Another vector carried a guide RNA to the specified spot and donor DNA to correct the mutation in a cut-and-paste approach that is spreading around academic labs like wild fire. Wilson says his team achieved a 10% reversion in the liver cells of newborn mice, with an increased survival rate for challenged rodents and a high death rate in the untreated group of newly born mice. In adult mice, though, the team say that the experiment didn’t work as planned, highlighting a needed correction in the process. And now they’re following up with new approaches to see how that might work. CRISPR/Cas9 gene editing is a rapidly developing technique that is thought to provide revolutionary new ways to manipulate genes for the treatment of a number of diseases. Delivering the CRISPR therapeutic in an efficient, safe and predictable way, though, has been difficult–to this end, researchers at UMass have created a means of administering the gene editor that could help send it to clinical trials. CRISPR/Cas9 is a natural immune system in bacteria used to protect them from foreign genetic material, and scientists have used its components to cut and repair DNA sequences to replace faulty, disease-causing portions with corrected versions. The difficulty comes about in getting the separate components (the Cas9 “scalpel,” the DNA repair template and an RNA guide) to the genetic material in a target cell. Previous attempts at delivering the system through disruptive, high-powered injection has caused damage to the liver and required too much volume when treating mice with metabolic diseases.